There were also other, unrelated traumatic events happening in my life and it all combined to make life way scarier than anything I could have seen on screen. I didn’t watch horror movies for the first twenty years of my life. I have an incredibly active imagination and I thought it would be a bad idea to give it more material. Even seeing a poster for a horror film would set me to shivering. But something happened after I started puberty. Life became a horror movie. To be fair, I was not prepared for puberty. I didn’t know what was happening to me, and I thought I was dying of internal bleeding. There were also other, unrelated traumatic events happening in my life and it all combined to make life way scarier than anything I could have seen on screen. Even later, life events like the death of my partner and the loss of a livelihood, moving across country and overseas, my family splitting, and two wrecks left me with plenty of nightmare fuel. I started to turn to horror as a way to cope with real life. Whatever happened in the story, there was almost always a survivor. If they could get through their own traumatic event – then so could I. So when I’m on my period and my uterus and ovaries are scrunched up and screaming, I turn on a gory horror movie and laugh at how fake it is. I see the corn syrup blood, the fake guts, and people getting stabbed and slashed and I feel like someone gets what it’s like to have a reproductive system that could kill you. Or that people are afraid of, or don’t understand, or want to remain a shameful secret. 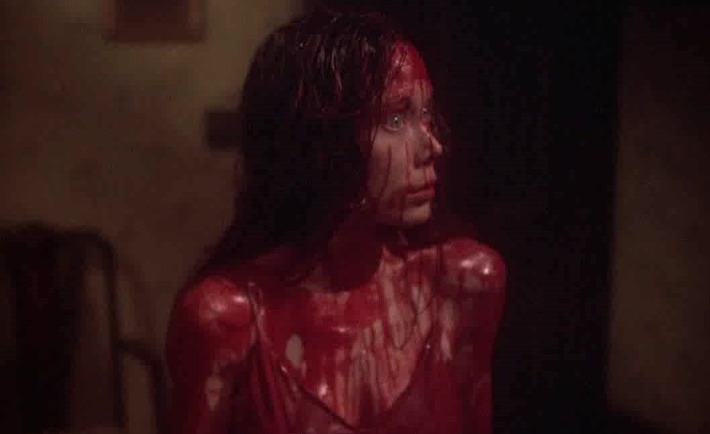 There are plenty of similarities between menstruation and horror – like how pregnancy is when a being can grow inside you and then burst out like an alien (While I do believe that birth is a miracle and it’s one of the most amazing things about the human body – many people have been forced to endure pregnancy and delivery against their will). Where every month something weird happens to your body and you turn into a different creature for a while. Where you feel as if you’ve died and resurrected. Where you lose blood and crave various items. I think horror is a genre that gets overlooked or looked down on as less valuable than other genres. There are plenty of bad horror movies, of course, but the genre in and of itself is a necessary one. There’s a reason that so many of us flock to see them and why franchises keep going. Why thousands of us will go see the new IT later this month (even if it terrified us as children and teenagers). Horror movies serve a purpose – even one above giving people a good scare. They can be testaments to what human beings can endure. How far love, hope, and determination can take us. What we do when push comes to shove – we can go far above our supposed limits. We are made of sterner stuff than we believe. Even those horror movies with unhappy endings for everyone are made for a reason. To remind us that, at some point, we’re all going to die. Doesn’t have to be right away, doesn’t have to be violent, but it’s coming. And in this way maybe horror also helps us prepare for death. We don’t have to be scared of it. It’s a release. A release from the fear we experience in this life. So the next time you’re going through a rough period (physically or otherwise), maybe think of it as a horror movie — one in which you’re the survivor.